Just Peachy Photography in Palatine is having some great deals on photo sessions this fall! We love Just Peachy Photography soooooo much because photographer Erika Williams has a gift for capturing the spirit of children in her photography. She picks wonderful locations that allow your kids some room to move around and be themselves rather than holing them up in a small room. Her technique results in some wonderful portraits! 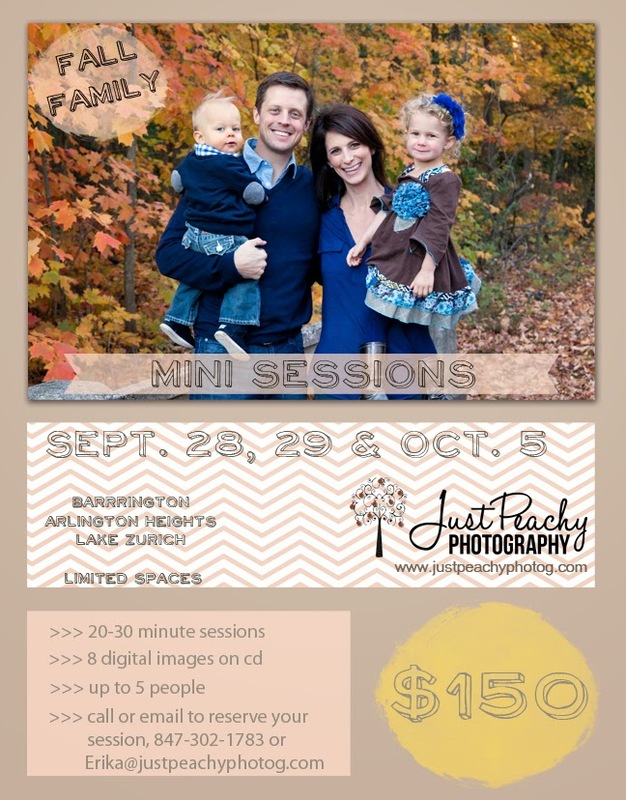 Below, I posted information about Just Peachy's Fall Family Sessions which will be going on this weekend, September 28 & 29 as well as on October 5. You must call or email in order to reserve your spot. Halloween Mini Sessions will be held on October 19th in Palatine. The session is 5-10 minutes. The session price is for one child and includes 3 photos in a private gallery and one digital image with a print release or 2 5 x 7's (same pose). Plus, you can get 25% off additional prints and products. Halloween mini sessions cost $25 ($15 for each additional child). Head over to Just Peachy's website for more info including how to reserve your spot. What a nice way to capture a special moment this fall!